Preparing for some serious drinking. I consumed 8 cups eload during and 8 cups emend immediately after my 44 km run. 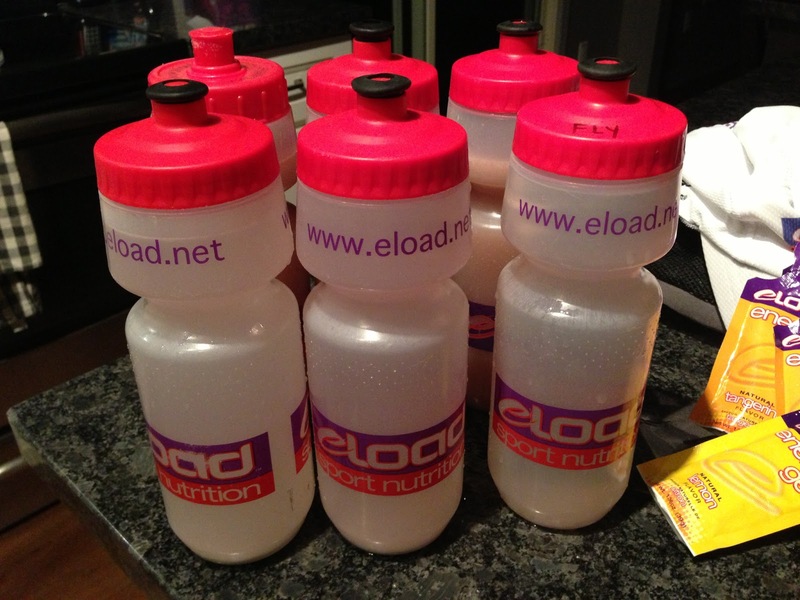 Using eload endurance and “Fly”was a great combination for my electrolytes, fluid and carbohydrate needs. And of course, emend allowed me to recover by replenishing my fluids, and some carbs and protein. Looking good, loop after loop after loop.We got James in this picture but missed Clayton. Training was a bit different this week since I was away at our cabin for family camp. I wasn’t sure we could make it this year because of my training, and Jonathan using most of his vacation for our trip causing me to be on my own with the kids. But because I knew it meant so much to our family, and thanks to my sister and aunt and uncle, it worked! Each day I ran the same route so people knew my location. Running along country roads again was great. And doing so in the heat was good just in case we get a hot day, Aug 10. I did some mile repeats and a solid tempo on the usual Monday and Wednesday. Upon returning to the campground after each run, I grabbed my emend recovery drink and went right to the pool. I did some laps then got out to play a dvd, called “Made to Crave” for a small group. During the dvd I stretched, used my roller and did my core exercises. Then I went back into the pool with the group. Each of us did our own thing but quite enjoyed the extra, kid-free space in the water to exercise. Every afternoon I rode my Cannondale bike that Jonathan brought from home and set up in the cabin on rollers. Then I’d head back to the pool, simply to cool off and take the kids for a swim. Same routine Monday to Friday. Loved it. Friday evening, Micah and I headed back to Brantford because he had hockey and I had a 44 km run Saturday morning. We got it done then headed back to the cabin to be with the entire family for the weekend. It was great. Total was 170 km and 17 hours of running, biking and swimming. Highest ever. We will start into a gradual taper right now, which will actually include a 5 km race on Thursday at Eaton Downtown Dash. Just a quick, short race to keep the legs fresh. It was an action-packed week and we are now home. Time to get to bed since tomorrow includes 800 m repeats, a tonne of laundry and unpacking, and a well-deserved massage.